After finishing my Ph.D. with Andrew at McGill, I more or less vanished from view. For almost two years, I have toiled in the darkness, chained to my desk, unseen by any in the land of the living. But now – now, I emerge into the light! And today, I am announcing the fruit of my labors: SLiM 2.0! 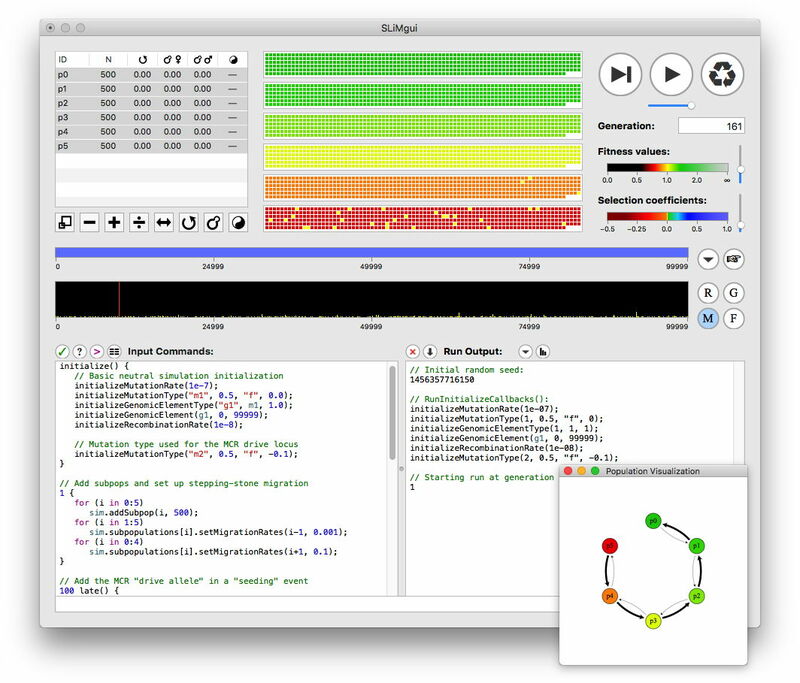 SLiM is a forward genetic simulation package. The old SLiM, which ended at version 1.8, was written by Philipp Messer of Cornell University. Then Philipp hired me into his lab, and – cue quick-cut sequence of toil, chains, and darkness – I have rewritten it and greatly extended it. We're very excited about it, because it brings a new level of flexibility, power, and usability to the realm of forward simulations. This shows a six-subpopulation model midway through a run. The six subpopulations have been set up as an "island model", connected by migration to form a chain with gene flow predominantly in one direction (like sites along a river, with gene flow tending to go downstream, for example). SLiMgui is showing the population structure in the subwindow at lower right; if you click to see the image at full size, you can see that arrows of different widths indicate the strength of migration between the subpopulations. SLiM is an individual-based simulation package; every individual in the six subpopulations is shown in the six arrays of colored blocks at top. The colors indicate fitness; in this model, a mutation has swept through the population, but there is spatial variation in selection that makes that mutation beneficial in some subpopulations (green) but deleterious in others (red). 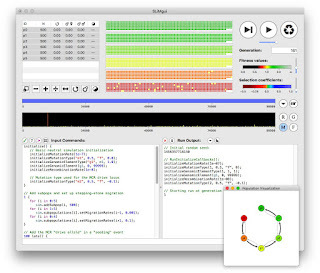 Running a simulation like this in SLiMgui is completely interactive; we can step forward a generation at a time, inspect individual organisms or even individual mutations, execute commands that modify the simulation even as it's running, and even pull up graphs showing things like the evolutionary trajectories of mutations. complex genetic structure – different types of mutations, different genomic regions, variation in the recombination rate along the chromosome, etc. complex temporal structure – modeling the introduction of mutations at particular times, detecting the establishment or completion of selective sweeps, making particular events trigger in particular generations or upon particular conditions, and producing customizable model output at particular times. Since you can do anything you want in your Eidos script, the sky is really the limit; we even have a recipe for a model of social learning of cultural traits that influence fitness, and a model of a "gene drive" powered by the CRISPR/Cas9 genetic modification mechanism. This all pretty much follows a recipe in the SLiM manual's "cookbook" (in section 12.3). That recipe then goes on to add a CRISPR/Cas9 "gene drive" that drives the introduced mutation through the whole system despite the fact that it is strongly deleterious in the upstream subpopulations. That scenario is actually what is pictured in the screenshot above; that is why the introduced mutation is fixing even in the subpopulations where it is deleterious. Without the "gene drive" – as modeled by the code given here – you get a nice simulation of migration-selection balance in an island model. I hope this whets your appetite for more! If so, surf to the SLiM 2.0 home page at http://messerlab.org/slim/ and download SLiM itself (as an installer app, if you're on Mac OS X, or as a source code archive if you're on Linux), manuals for SLiM and Eidos, and some other goodies. There are links there to mailing lists that you can join to get announcements (slim-announce) or to ask us questions, start discussions, log bug reports, and so forth (slim-discuss). SLiM is open-source and free to use (we ask only that you cite our soon-to-be-published paper), so enjoy it – and let us know how it goes for you! Curious about the speed-up compared to previous SLIM. Is it several times faster or just a few % faster? It depends on the model you're running, of course, but generally it is approximately 2-3 times faster in our testing.